In this article we’ll show you how to backup your data and fully reset the Vivaldi browser. IMPORTANT This article is for advanced users. Following the steps described here will result in losing all your Vivaldi data (Notes, Bookmarks, Web Panels, etc.) and settings, such as cache, history, themes and so on. If you want to continue and fully reset Vivaldi, please make sure you have a backup of your data before you proceed. One option to back up some of your data is to Sync the data. Just make sure you know the encryption password, as there’s no way to reset the encryption password without losing all the data. Alternatively, you can make a backup of the profile folder, which includes some key elements of your Vivaldi setup, such as preferences, profile and settings. Most of the key components are stored within the Default folder, though you should also retain the First Run file stored alongside it. Deleting this file will make Vivaldi assume it is starting up for the first time. Login Data – website passwords. Note: This file is encrypted and is only usable on the machine that created it. 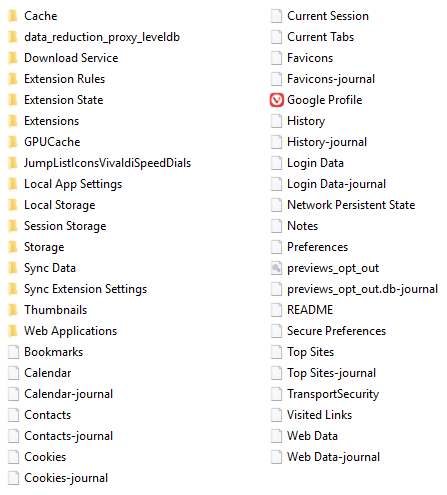 Extension Rules, Extension State, Extensions, Local Extension Settings, Local Storage, Managed Extension Storage, Extension Cookies and Secure Preferences – all extension preferences and extension data are stored here. Make a copy of the Default folder and First Run file and paste them, for example on your Desktop or Documents. Go to vivaldi://about or “V” menu > Help > About. Make a note of the directory listed under Profile Path, minus Default. Go to the Vivaldi folder. Once you’ve located the correct folder, close the Vivaldi browser. In the system window delete the entire User Data folder. 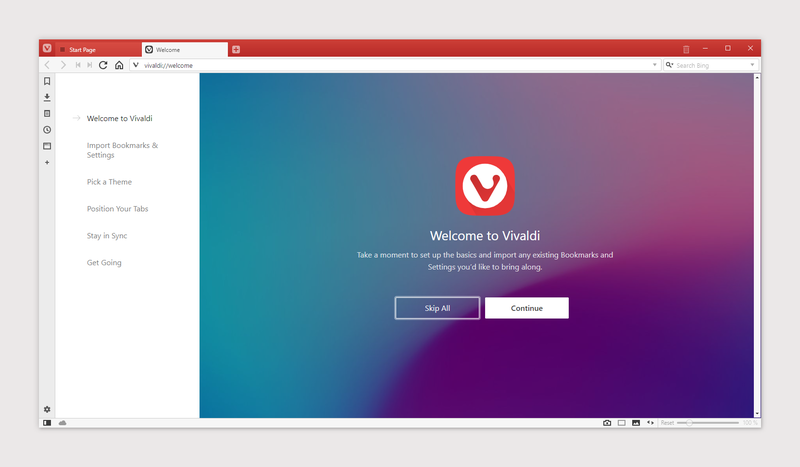 If you have completed the steps successfully, you will see the “Welcome to Vivaldi” screen as you start Vivaldi.